The Norlake KLB810-C Kold Locker™ walk-in refrigerator is built with interlocking panels that secure together with mating rails to keep in cold air. These panels contain a dense layer of polyurethane insulation between two 26-gauge steel walls, and each wall has a stucco-embossed, rust-resistant finish. To withstand daily use, the door has durable hinges and magnetic gaskets that seal tightly. 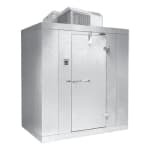 To save energy, the door closes itself, while a release mechanism inside the cooler acts as a safety measure to prevent accidental entrapment. To reduce the risk of tampering and theft, a deadbolt secures the refrigerator's contents, while an LED light brightens the interior, switching on and off to save energy. On top of the Norlake KLB810-C indoor walk-in refrigerator, the Capsule-Pak™ refrigeration system keeps the unit operating at 35 degrees Fahrenheit. This placement gets the cooling system out of the way, providing more space on the sides, though this means more space is needed on top to accommodate the unit. Both the evaporator coil and the condenser are inside the system, creating a one-piece unit to simplify installation and servicing. 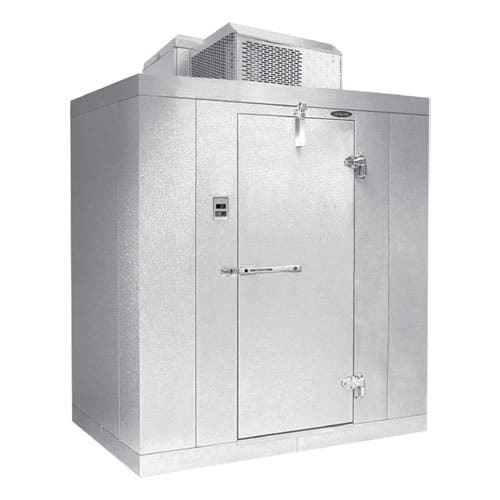 Interested in walk-in refrigeration? This walk-ins resource article discusses them in further detail.